The majestic sport of dressage has returned to Wellington, home of the Adequan Global Dressage Festival, for another amazing season of this majestic Olympic sport. Often compared to horse ballet, or dancing with horses, dressage showcases the grace, beauty and elegance of a horse and rider pair working together as one. From elite dressage to more introductory levels to the uplifting sport of para-dressage, all levels of the sports are on display here in Wellington this winter. While it may look effortless in the ring, dressage performances are really the end result of years of hard work. Once again, we celebrate this hard work and determination in Faces of Dressage 2019, highlighting just a few of the amazing riders you can see in action this winter at the AGDF. Tinne Vilhelmson-Silfvén of Sweden is one of the greatest dressage riders of all time. Vilhelmson-Silfvén began riding at age seven and became interested in dressage after her mother taught her about the sport. The seven-time Olympian is a master of training young horses into being some of the best in the world. Vilhelmson-Silfvén has also competed at six World Equestrian Games and 10 European Dressage Championships. She has won three bronze medals in team competitions at the European championships, and also competed at seven editions of the Dressage World Cup finals. 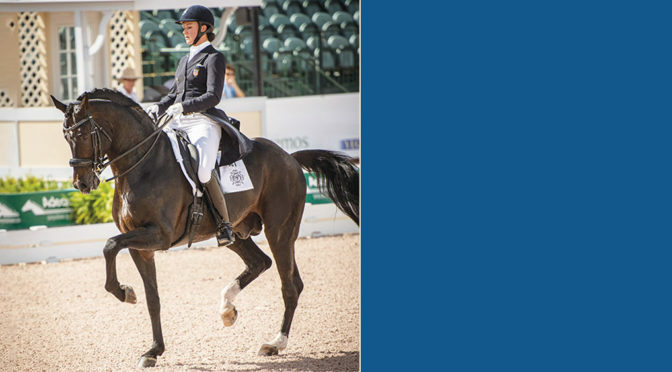 Vilhelmson-Silfvén has been spending winters in Wellington for nearly a decade and continues to shine at the Adequan Global Dressage Festival. Early in the 2018 season, she wowed the crowd riding Paridon Magi at the FEI Grand Prix Freestyle CDIW. She launched the 2019 season in similar style, this time taking third aboard Don Auriello. 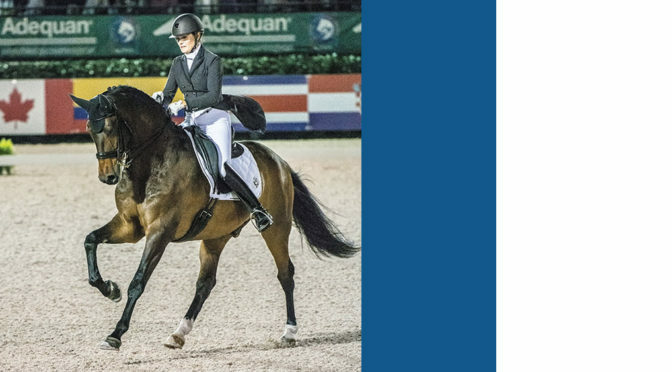 After placing eighth individually with Don Auriello at the 2016 Olympics in Rio and competing at the World Equestrian Games Tryon 2018, she is now focused on qualifying for the 2020 Olympics in Tokyo. Laura Graves and her horse Verdades have a strong bond of harmony and talent. Graves and her mother brought the horse as a foal from Holland, and she set to work to master each step of the training. In 2014, Graves impressed the judges at the U.S. Dressage Championships in Gladstone, N.J. She placed second overall and received one of the highest scores of any American rider to qualify for the 2014 World Equestrian Games. That summer, her first time in Europe to compete, the pair impressed the judges at the CHIO Aachen 5* and then at the WEG in Normandy, France. In 2015, she competed at the Pan American Games in Toronto, where she won the team gold medal and the individual silver medal. In 2016, Graves competed at her first Olympics, capturing the bronze medal in the team competition in Rio and earned the fourth position individually. In 2018, she scored an impressive 84.675 percent in CDI-World Cup Qualifier FEI Grand Prix Freestyle. 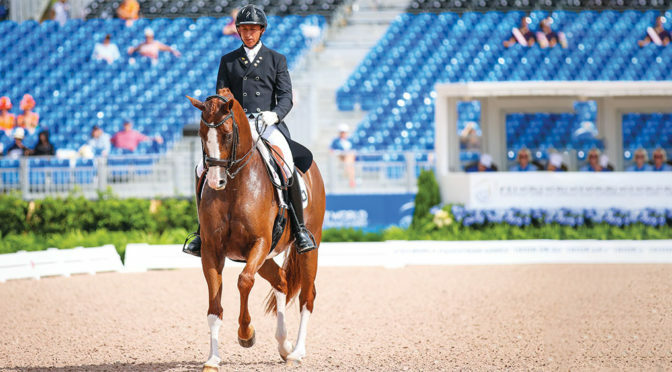 Later in the year, Graves and Verdades represented the U.S. at the World Equestrian Games Tryon 2018, capturing the individual silver medal after a stellar performance in the Grand Prix Special. She helped lead the U.S. team to the silver medal as well. Raised on a small cattle farm in Whidbey Island, Washington, Adrienne Lyle has always spent time around horses. She originally rode western, then switched to English at age seven. She tried eventing before dressage became her calling. Lyle began competing at 13 years old. She was a member of the silver medal team at the 2002 Cosequin Junior Dressage Championships and the bronze medal Region 6 team at the 2004 North American Young Rider Championships. Lyle has trained with Olympic dressage rider Debbie McDonald. Career highlights include competing in the 2012 Olympic Games in London and contributing to a fourth-place team finish at the 2014 World Equestrian Games in France. 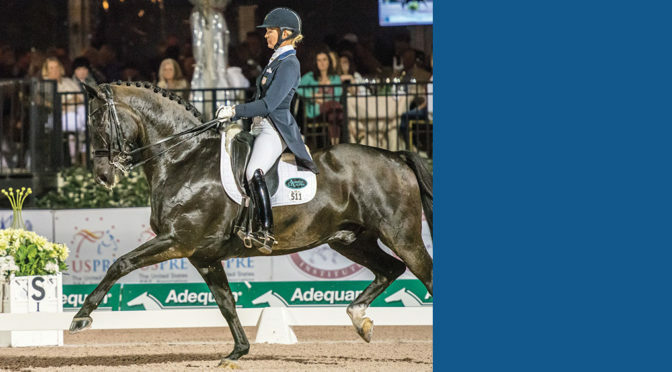 2018 was a banner year for Lyle and her mount Salvino, with a string of wins at the Adequan Global Dressage Festival, including a breathtaking victory in the Nations Cup Grand Prix Freestyle CDIO3* to cap the season. The pair qualified for the World Equestrian Games Tryon 2018, where they helped the U.S. team win the team silver medal. Lyle and Salvino are back in action this season in Wellington. Canadian Jill Irving has taken top honors in some of the sport’s top competitions. In 2012, Irving placed ninth in the Intermediate Adult Amateur Year-End Awards. In 2013, she took the coveted Grand Prix Adult Amateur Year-End Award, and she was also awarded the Piaffe Performance Adult Amateur Achievement Award with her mount Pop Art. In 2014, she won the Everglades Dressage Rider Achievement Award at the Adequan Global Dressage Festival. Irving, who had not previously ridden on a championship team, took horses Degas and Arthur to Europe in 2017 to compete at four major shows. She showed both at the CDI 4* Achleiten in Austria, earning great scores and getting her named Red Scarf Equestrian Dressage Athlete of the Month. This helped her secure a spot on Canada’s dressage team for the World Equestrian Games Tryon 2018, where she competed aboard Degas. Irving started the 2019 AGDF off in impressive fashion, winning the FEI Grand Prix Special CDI3*, presented by MTICA Farm, aboard Arthur. Aside from her work in the ring, Irving has spearheaded the Canadian Youth Equestrian Mentorship Program since 2015, which offers opportunities for young Canadian equestrians to attend training camps in Wellington. Growing up, Julio Mendoza rode horses and taught students on his father’s farm in Ecuador. He trained several dressage horses to the Grand Prix level and competed in the International Cup held in South America for five years in a row. In 2007, Mendoza moved to the U.S. He resides with his wife Jessica and their three children in North Carolina, not far from the Tryon International Equestrian Center. 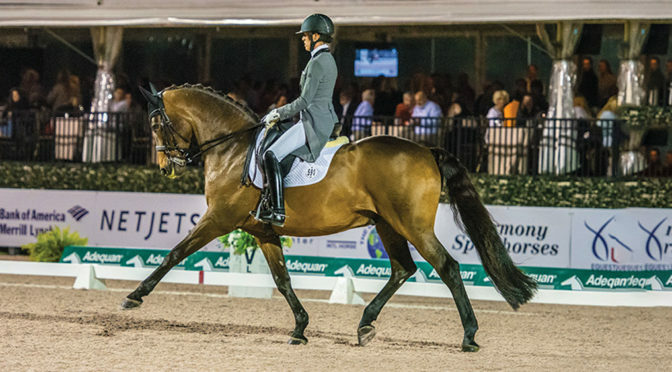 In 2010, Mendoza earned his USDF Silver Medal and also qualified for Dressage at Devon. The next year, he earned his USDF Bronze Medal and qualified for the 2011 Pan American Games in Guadalajara with his nine-year-old Friesian stallion Ivan. In 2013, Mendoza earned his USDF Gold Medal aboard Ivan. In 2015, Mendoza and his mount Chardonnay qualified for the Pan American Games in Toronto, where they finished 17th individually. In 2017, Mendoza traveled to Bogota with Chardonnay to compete at the Bolivarian Games, grabbing three gold medals. Last season, Mendoza’s top goal was to qualify for the 2018 World Equestrian Games. They earned a qualifying score in Wellington and then came home to Tryon to earn a second qualifying score. 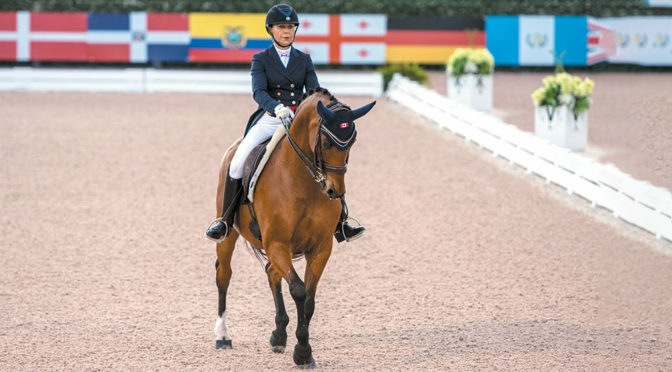 In September, Mendoza became the first rider ever to represent Ecuador in dressage at WEG. One of the all-time great top coaches, trainers and riders, four-time Olympian Ashley Holzer changed her citizenship from Canadian to American in 2016 after being based out of New York since 1994. Holzer began riding as a teen, first entering the Grand Prix ring in the 1980s. She was a member of Canada’s bronze medal dressage team at the 1988 Olympics and represented Canada at the World Equestrian Games in 1990, 2002 and 2006, and the World Cup Finals in 1989 and 2009. She won team gold and silver at the Pan American Games in 1991 and 2003, respectively. Holzer has been competing in Wellington for decades and enjoys sharing her talents while teaching and competing. She has coached many riders, including P.J. Rizvi, Jill Irving and Brittany Fraser-Beaulieu. She won the Most Valuable Rider award at the 2016 Adequan Global Dressage Festival. She rides Havanna 145, owned by Diane Fellows, in the international ring, while bringing along several other horses as well. This season, Holzer rode Valentine to victory in the FEI Intermediate I Freestyle CDI3*, presented by Fair Sky Farm, during AGDF Week 5. Olivia LaGoy-Weltz grew up in San Francisco, where she began riding at age 5. In 2002, she moved to Europe and spent five years in Holland and Germany at several top barns. She then returned to the U.S. and started her own dressage training business. Currently, LaGoy-Weltz runs a selective training program dedicated to top-quality horse and rider development at Mountain Crest Farm and is based seasonally in northern Virginia and Wellington. LaGoy-Weltz began competing on the Florida circuit in 2009. In 2012 and 2013, she had strong performances with Rifallino. 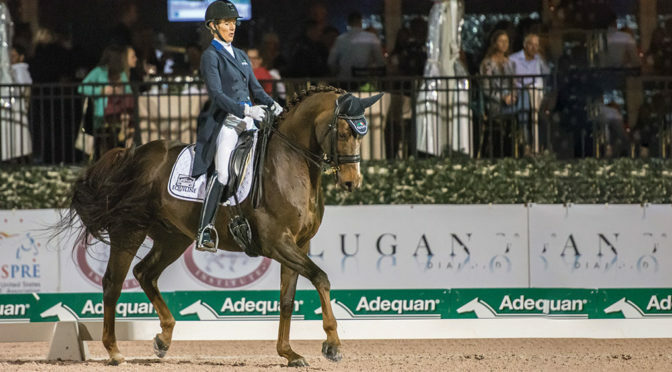 At the Palm Beach Dressage Derby, she and Rifallino won the National Grand Prix Special and then won the National Grand Prix Freestyle at the Wellington Classic Dressage Challenge II. In 2014 and 2015, LaGoy-Weltz achieved several top placings with Lonoir. A USDF gold, silver and bronze medalist, she was Traveling Small Tour Alternate for the 2015 Pan American Games. LaGoy-Weltz had a strong 2018 in Wellington, where she and Lonoir chalked up several victories at the 2018 AGDF, including taking the Grand Prix Freestyle CDI4* during Week 10. She wrapped the circuit helping the American team dominate the Vinceremos Therapeutic Riding Center FEI Nations Cup CDIO3*. Arlene “Tuny” Page, owner of Stillpoint Farm, has been a leader in Wellington’s dressage community for decades. She began her professional riding career as a three-day event rider in the 1970s, making the switch to dressage in the 1990s. 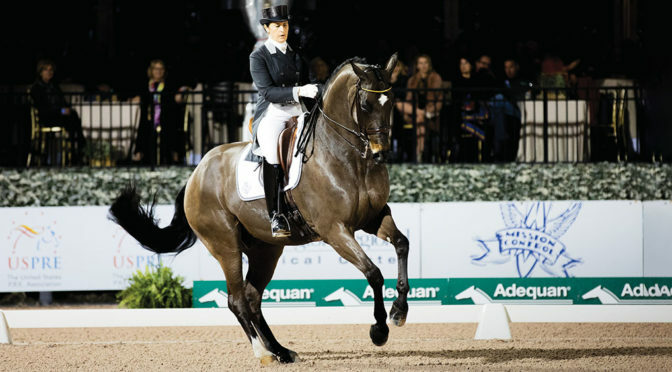 She was the U.S. Freestyle Champion and U.S. representative to the FEI World Cup in 2006, as well as an alternate to the World Equestrian Games team in 2006, to note just a few highlights from her long career. Page has long been a champion of the Vinceremos Therapeutic Riding Center and also one of the founding members in building the Adequan Global Dressage Festival, of which her Stillpoint Farm remains a key sponsor. Page credits Vincente Guilloteau for allowing her to develop a great partnership with her world-class partner, Woodstock. After many years in the ring together, the pair is still posting strong showings, such as a second-place finish in the Grand Prix Freestyle CDI4*, presented by Havensafe Farm, during AGDF Week 10 last year. 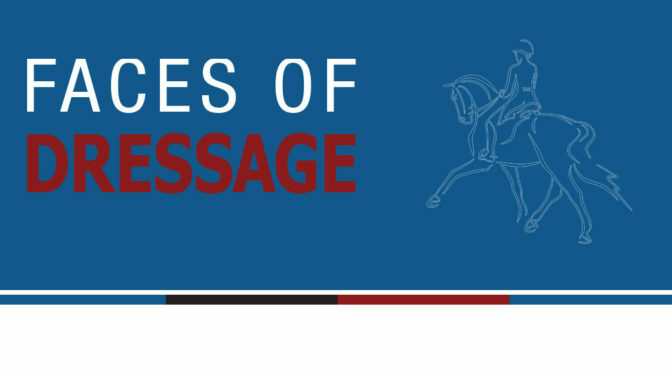 Page also serves the dressage community on the USET Foundation Board of Trustees and the USEF High Performance and Active Athlete Committee. Katherine Bateson-Chandler, born in Great Britain, moved to New Jersey when she was 13. Starting at age 16, she worked for American dressage star Robert Dover for 16 years until his retirement, traveling with the horses to international competitions. Based in Wellington, Bateson-Chandler and her mount Alcazar, owned by Jane Forbes Clark, regularly compete at the Grand Prix level. Currently, Bateson-Chandler trains each summer in Europe with Olympian Carl Hester and gains international exposure competing abroad. 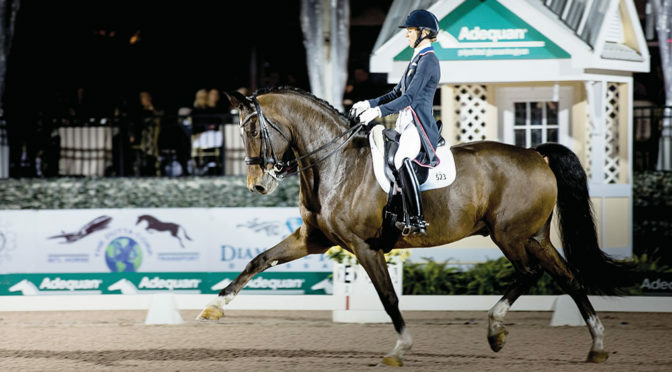 In 2017, Bateson-Chandler and Alcazar won over the crowd and the judges with a sensational first-place performance in the CDI 4* Grand Prix Freestyle at the Adequan Global Dressage Festival. They went on to compete for the U.S. in the 2017 Uggerhalne, Denmark CDIO Nations Cup, and then helped Team USA claim the bronze at the 2017 Hickstead FEI CDIO3* Nations Cup. In 2018, Bateson-Chandler and Alcazar won the Grand Prix Special during AGDF Week 5 and placed third in the Grand Prix CDI4* during Week 10. Strong showings so far this season for Bateson-Chandler and Alcazar include second place in the FEI Grand Prix CDI5*, presented by CaptiveOne Advisors, during AGDF Week 5.